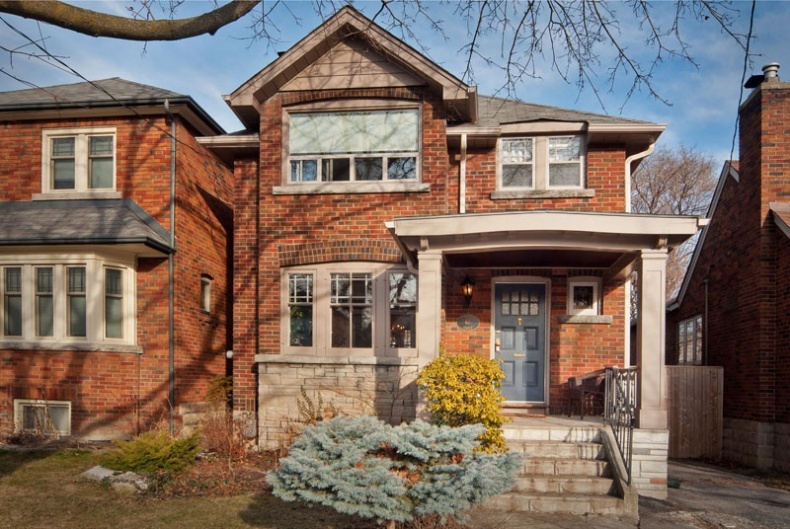 New listings are a rarity in New Toronto these days, so when this updated, two-storey house near Humber College hit the market it drew out 40 groups each day - not including the traffic at the open houses. A handful of house hunters liked enough of what they saw to make an offer. Just up the street from the lake and Rotary Park, this roughly 80-year-old brick house sits on a 28- by 113-foot lot with a rare private driveway out front and an interlocking brick patio in the fenced yard. Between 2004 and 2011, this 1,140-square-foot house was redone with new wiring and cooling systems, a stylish kitchen with limestone backsplashes, Cesarstone counters and stainless steel appliances and a remodelled bathroom with marble counters and heated floors, a glass shower stall with a built-in seat and subway tile surround. Classic details also shone, such as hardwood floors throughout, original stained glass windows framing a wood burning fireplace in the living room, and decorative plate rails and crown mouldings in the dining room. The upper level has three bedrooms, while the lower one has an open area with storage, laundry facilities and a side entrance. "It's half a block up from the lake and there are lots of cool recreation for kids and adults, from skating in the winter to biking in the summer," says agent Julie Kinnear. "It's a really popular neighbourhood for young families." If the area didn't sell buyers on the place first, its historic charm and character did. "I got calls from everywhere because it had a classic look to it and [buyers] didn't realize it was in South Etobicoke," says Ms. Kinnear. "[The sellers] hadn't opened it up, so they kept it very traditional. But they had a fantastic bathroom that was unbelievably gorgeous and a totally renovated kitchen, so that was good too, that mix of mix of old and new." Bedford Park Players run of ‘Bad Habit’! Easter Colouring Contest 2012 Winner!